You are here: Home > Company > Customer Stories > Washington Engineering & Architecture, P.C. 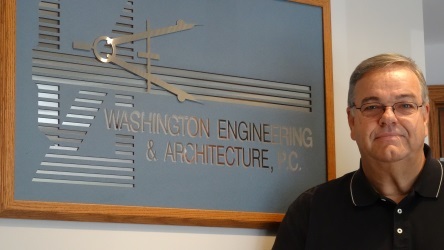 Design Master “Fits Like a Glove” at Washington Engineering & Architecture, P.C. Washington Engineering & Architecture, P.C. is a full-service design firm offering architectural, structural, civil, mechanical, electrical and rendering services. Based in Washington, Missouri for over twenty-five years, Washington Engineering & Architecture focuses on local projects under $5 million, such as smaller factories, school additions, churches and other municipal, educational and commercial structures. The company currently has seven employees. “Design Master is designed to provide probably the most accurate and fastest method of producing MEP construction drawings,” explains Mr. Unnerstall. “As a small firm with a small profit margin, we have to be quick and accurate. This program allows us to do that, so we can accomplish more with less staff. “The software is always evolving and improving. Design Master recognizes the responsibility that engineering firms have to be accurate. You can talk to them one-on-one about how they do their calculations and how they compare to other methods—the information is even on their website . You’d never see AutoDesk do that…” Mr. Unnerstall observes. “Being as small as we are, I am the IT department,” continues Mr. Unnerstall. “Very seldom do we have any problems with the Design Master software and anytime we do, it’s resolved within a few hours if not within the hour. “When you call Design Master support you can talk directly to the programmer who maintains the software! That’s remarkable in this age of overseas call centers. “One time I was working on a rush job that had to be done that day. I came back at lunch to finish it, but the file wouldn’t open. I sent it to Design Master, got it right back all fixed up and met my deadline. Mr. Unnerstall continues: “The mechanical and electrical versions of the software go hand-in-hand, which makes it very easy to collaborate and share work on projects. Once you put in your light fixtures in Design Master Electrical you can export that into Design Master HVAC as a background layer, which makes it fast and easy to coordinate your diffusers with your light fixtures and vice versa. “Design Master makes us much more efficient, which makes us more competitive, which equals more work. It really supports our bottom line. “I don’t know what we would do around here if we didn’t have Design Master,” Mr. Unnerstall concludes.